For my base I used L'Oreal - Blanc De Lune*, then I used L'Oreal - Greige Amoureux* and L'Oreal Noir Oxyde* for the marble with a clear jelly stamper. Then I used Barry M - Orange Fizz* from the lolly gloss collection for the main flower, and added Barry M - Purple Pop* (from the same collection) to the centre. I used the brush from the bottle for this. For the dots I used my Winstonia striping brush* and the leaves, which were done using Essie - Off Tropic* were also done using this brush. Finished off with a coat of Seche Vite, and whilst that was drying I added a Swarowski Crystal from All That Jazz to my ring finger. Love how this came out! Such a good idea to mix marbles and florals! 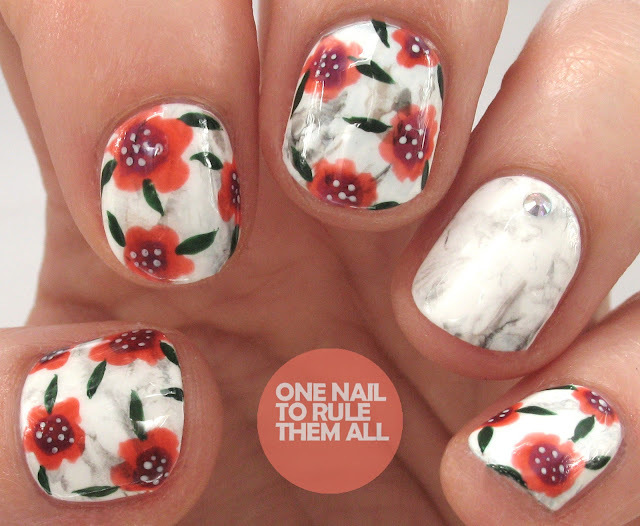 The marble and flowers look like heaven together, seriously beautiful! These are definitely NOT a nail fail! The base looks beautiful, soft and sophisticated and paired with the flowers look even better. I agree with the ladies, pairing marble with flowers was a great idea! I honestly think this is one of my favorite manis of yours! 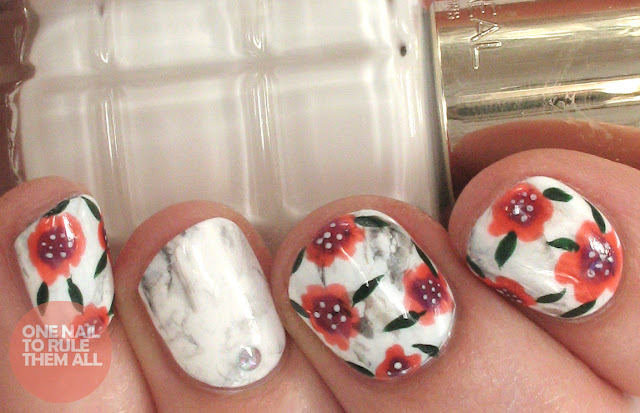 The marble does look really good but the flowers really complete the look. So cool!! Nope, never a fail! These are lovely, I love the colours, the contrast of the marble against the flowers, everything. These are gorgeous Alice! Your marble technique is flawless! !